When I ask someone -who is Helen Greiner?- the response is usually a blank stare. Helen who? OK- have you heard of Roomba? Now that’s a familiar name. Well, Helen Greiner is the woman behind that invention. It is just one of the products produced by iRobot, the company she co-founded in 1990. Other household-friendly robots include Scooba for scrubbing floors, Looj for cleaning out gutters, Mirra for cleaning pools. My goal since I was 11 has been to create robots. Now this dream has been refined to delivering robots that help people by taking on dangerous missions and dull and dirty chores. 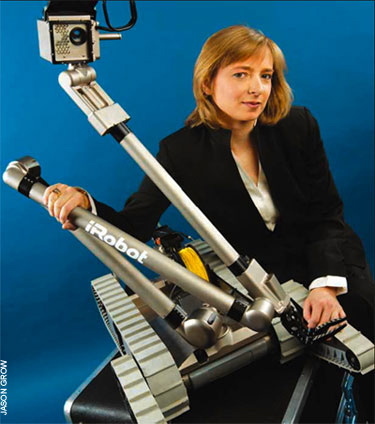 Her interest in protecting people in dangerous situations led to her creating a division of iRobot that supported military, defense, and first responders. One of the most successful products has been PackBot. Among other applications, it has been used in Afghanistan & Iraq- to investigate caves and dispose of explosives, Fukushima-to survey damage at the damaged nuclear plant, and in Watertown to aid police if finding the Boston Marathon bomber. A serial entrepreneur (as well as serial innovator), her latest company is CyPhy Works. I suspect the name honors the movie genre that inspired her to pursue robotics is the first place: science fiction [R2D2 won her heart in Star Wars]. The focus here is on UAVs which she describes a flying robots. In her 2013 TEDxBoston talk– she explains how UAVs are helping preserve endangered speeches, enable safe deliver pesticides when needed, reduce cost of inspecting civil infrastructure. So now you know just who Helen Greiner is. She’s pretty damn awesome!